It just got very cold in Wisconsin. The weekend was beautiful, a 60° Saturday and a gentle, gentle rain much of Sunday. I was like to think of an autumn rain, especially one just before freeze, as soaking the ground in to get it ready for spring, and then the freeze is like a blanket that seals the moisture in. While the actual growing season probably ended more than a month ago, there's still some kale, brussels sprouts and hearty spinach still out there. But today's cold-weather brings the undeniable end to this year's garden. My community garden plots have been cleaned out for more than a month, except the beets. In early August after I pulled all my onions out of the ground, I asked people who read this blog what I might plant in that space that could still grow enough to produce a crop before the end of the year. A number of people suggested I plant beets, and visions of my moms pickled beets floated through my mouth, so planted two varieties covered at them with row cover and largely ignored them while I tended the rest of my abundant garden. Once tomatoes had been harvested, salsa and marinara canned, eggplant mashed into baba ganoush, etc., and Jay and I cleaned out our garden beds, I once again noticed the white row cover, plump with beet tops pushing against it. I checked on the beets occasionally, and while small, they were still growing so I left them in the ground. A few days ago, while Jay, Dale and I were making apple butter, we found ourselves with a little extra time and decided to pickled the beets. I went to the garden, pulled off the roll cover, and started tugging on beet tops. To my dismay, the beet tops broke off the roots quickly, and I realized I'd need to dig them out by hand. This is when I discovered there was nothing to dig out, and in fact some hideous creature had systematically eaten every one of my beets. I was disappointed, to say the least. This had been my first attempt at succession planting in my garden, and it would have been a success had not been for some lousy rodent. Next year, I won't leave them in quite as long. I belong to a couple of email lists, one of them is the Madison permaculture list, and the following entry caught my eye. MAPG offering Permaculture Design Certificate Training. I first had to learn a little bit about what permit culture means, and went to the trusty Wikipedia to find out. Has anyone reading this taken this or any other permaculture series of classes? I'd love to hear what you thought. I think I'm going to enroll. 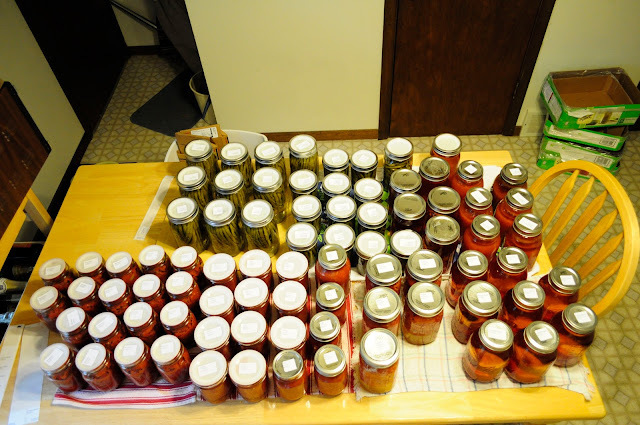 Canned salsas, tomatoes, tomato water for soup stock and dilly beans after one epic canning day.